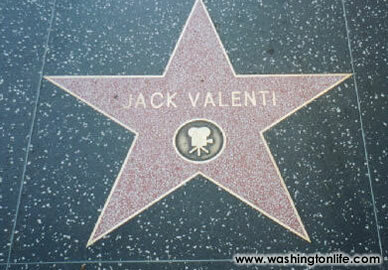 "Jack Valenti was a giant who loomed large over two of the world's most glittering stages - Washington and Hollywood. Both are far better for his contributions." - Dan Glickman, chairman and CEO of the Motion Picture Association of America. Both of those worlds celebrated Valenti's life at a memorial service on May 1 at St. Matthews Cathedral in downtown Washington. In a town long accustomed to the comings and goings of the Hollywood elite, it was the collective presence of West Coast heavyweights Kirk and Michael Douglas, Katherine Zeta-Jones, Martin Scorsese and Steven Spielberg blended with the East Coast political power of Sen. Ted Kennedy, presidential hopeful Sen. Joe Biden, former LBJ chief of protocol Lloyd Hand and Speaker of the House Nancy Pelosi that reflected the enormous respect, admiration and devotion Valenti commanded in both life and death. The diminutive Texan was larger than life and led more lives than the proverbial cat: decorated World War II pilot, Harvard MBA graduate, advertising executive, special assistant to President Lyndon Johnson, author, lecturer, speech writer, lobbyist, columnist, president of the MPAA and a man with his own star on the Hollywood Walk of Fame. To the public, he was best known for implementing the movie ratings system while remaining a tenacious protector of freedom of speech. Always conscious of the resulting impact the system would have on fi lms, he once advised his colleagues, "I don't care if you call it AO for Adults Only, or Chopped Liver or Father Goose. Your movie will still have the stigma of being in a category that's going to be inhabited by the very worst of pictures." While the ratings sounded like an ad for alphabet soup, it became the standard markup for identifying content: G, PG, PG-13, R, NC-17. Introduced in 1968, it was always a diffi cult rating balance, but parents loved it and it remains intact today with a little follow up tweaking now and then. JUST IMAGINE IF PEOPLE REMEMBERED YOU THIS WAY. "In a sometimes unreasonable business, Jack Valenti was a giant voice of reason. He was the greatest ambassador Hollywood has ever known and I will value his wisdom and friendship for all time." "We never had a wiser or dearer friend and never will again." "The best thing about Jack is that he never said anything bad about people, although he loved to talk about them." "He was so charismatic. There was never any falseness with Jack. He would always tell you the truth." "I still can't believe that Jack is gone. He was my best friend for over 45 years. I will miss him." To his friends, he was always the proud, charismatic Italian American who was a visible host at events refl ecting his heritage - from Washington galas to the Oscars in LA - and a man who worked fervently to preserve that heritage. Often in the presence of Sofi a Loren, Lena Wertmuller or Sylvester Stallone, his Sicilian ancestry was a natural fi t in a profession often dominated by Italian fi lm genius. 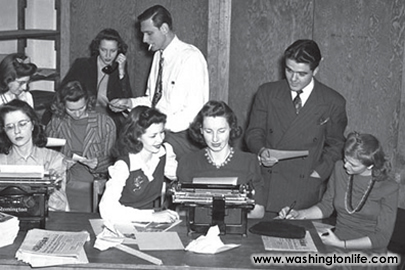 He always remained in awe of major stars: rumor had it that he was left speechless upon fi rst meeting Miss Loren. By the time you read this, Jack Valenti will have been laid to rest at Arlington National Cemetery with all the military honors befi tting one who served his country bravely, including having fl own 51 combat missions in WWII. Jack's 85 years were chock full of multidimensional accomplishments. He was a prolifi c writer, sought after public speaker, the top aide to LBJ (one of the most demanding and powerful presidents of the United States), and an effective, dynamic advocate for the infl uential motion picture industry - which he led for 38 years, interpreting Hollywood to Washington, and vice versa. 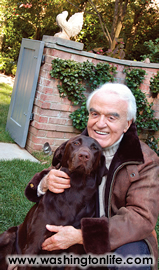 Jack's many kind and generous acts caused many to believe he was their best friend. He was. Following his retirement as MPAA president, Jack committed himself passionately as president of the Friends of the Global Fight - to eradicate the world of HIV/AIDS, TB and malaria. Throughout his life, he practiced what he preached: loyalty, dependability, generosity, commitment to his family and friends, and an irrepressible commitment to excellence in everything he undertook. Good was not enough - he wanted to be the best. I know of only one goal where he fell short of the mark - reducing his 35 golf handicap! One of the invaluable legacies for me and for the many others who knew and loved Jack, is that he caused us to want to be better in everything we did. His friendship has been treasured and will be missed, but memories of his many efforts to make this a better world will live on for all of us privileged to know him. 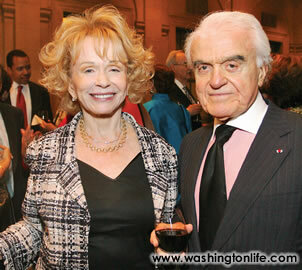 Mary Margaret and Jack Valenti at the Aspen Institute Bipartisan Awards in June 2006. 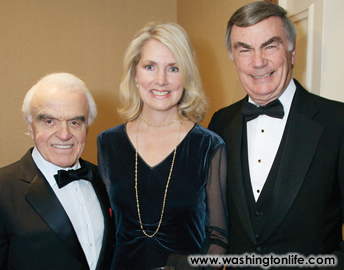 Valenti, Jan Smith and Sam Donaldson at National Italian American Foundation in 2006.